When the founder of whimsical toy company Zevo Toys realizes he’s dying and his children aren’t ready to run the business, he must ask his brother Leland, an army general, to take over. General Zevo immediately begins draining the innocence from the company, first by combating corporate espionage with checkpointed security, then by trying to introduce war toys, and then, behind the family’s back, siphoning the company away into tiny, cheap arms production. Leslie, the heir apparent son, is flaky, but not too flaky to sit idly by and let this happen. Leslie Zevo himself seems almost like two different characters. He’s introduced at the beginning as a manchild, and then it seemed like somewhere in the late second or early third act he was replaced with a champion of innocence trying to be a hero, but more ineffectual than the movie tries to make him seem. Even after all that character development that seemed to happen overnight, his contribution to the finale is following his cousin’s plan to get inside, having the idea to send the old toys to fight the new, and personally confronting his uncle. Robin Williams seems at home in either capacity, though. Meanwhile, I found the General both more interesting and more consistent. I wasn’t sure about Gambon’s accent at first. It sounded like he was trying to do an American accent and not quite getting it right past remembering his Rs. But then he got a line about how he didn’t get past three-star general because he grew up in Britain and his accent held him back, and I was disarmed. I didn’t realize until Leslie made a speech at the start of the finale that this is a very strongly ideological movie reacting to the loss of innocence in children’s toys as they’re replaced with realistic violent video games and gory action figure playsets. I’m not sure if it’s a failing on my part or the movie’s that Robin Williams had to drop that anvil for me to notice it. The idea of war being fought by kids who think they’re playing video games is not a new one to me, but this did it very effectively. The General’s idea for toy-inspired drones is of course years ahead of its time. The world of Toys is a skillfully designed fantasmagoria, another example of director Barry Levinson’s skill with worlds a few big setpieces off-kilter from our own. I’m starting to see him as a less Gothic counterpoint to Tim Burton. The end result is very 90s, but I think it works better that way than something more modern. Particularly beautiful is the climactic toy war, which is more symbolic than relevant. It’s just a distraction to keep the toy-sized drones at bay, and rather sad to see the wind-up toys that are lightly personified, but still hopelessly outmatched, go up against them. Apparently, this movie has a bad reputation, and, aside from some slight character and plot issues, I don’t feel it’s justified. The story is good, the jokes are amusing, and the design is marvelously whimsical. The thing I’m most turned off by is its early 90s aesthetic, which would be unfair to hold against it. 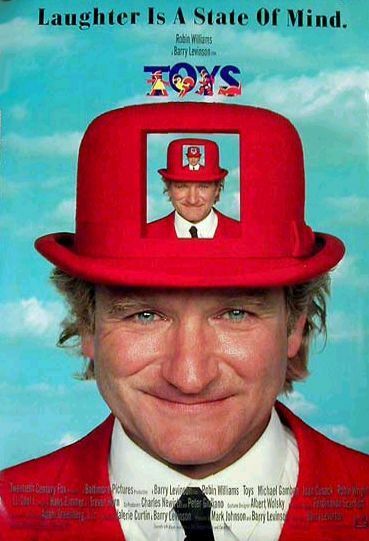 Then again, people hold “has Robin Williams” against movies these days.